Cosplay as a hobby has gone from strength to strength the world over in the past decade but has recently began to take hold as a major way of life for many people in Belfast, Northern Ireland. 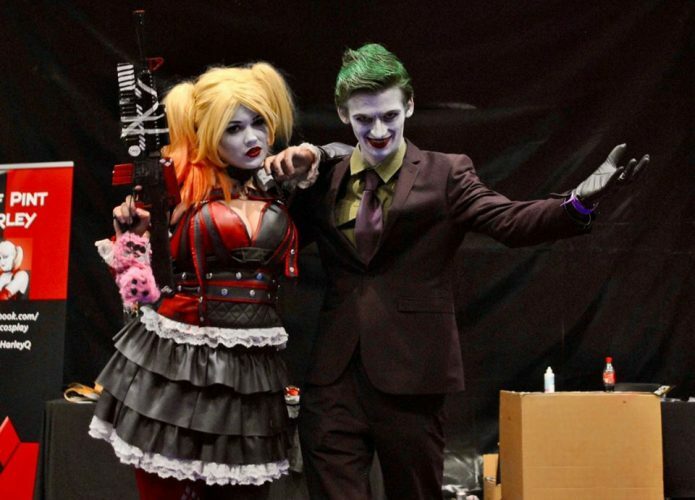 With the likes of MCM and Showmasters bringing conventions to the four corners of the UK and Ireland in the last few years, cosplay hungry nerds in the Emerald Isle have been getting the sewing kits and glue guns in action and making their mark on the world of cosplay. Geek Pride sent TrekkieMark and cameraman Dave Foy to meet some of the rising stars of cosplay in NI. GP: So what are you cosplaying as today? GP: What’s your go to Cosplay costume? S. I would normally do Moriarty. A. I would do a lot of Disney characters recently but I’ve done a lot of video games, I would say I’m a really casual cosplayer; I just go with whatever I feel like going. GP: How did you make this shirt? S. Fabric markers. A LOT of fabric markers! GP: What type of cosplayers would you say you are? Hands on with sewing or good at finding things? A. I’m terrible at sewing but I’m good with a glue gun. S. I can’t sew, it’s just glue, paint and markers. Anything you can make it with and find. A. It’s about finding things, not just going online and buying an entire costume but making an effort by going to thrift shops and going on eBay. GP: How long you guys been cosplaying for? A. About 2 years. I cosplayed once when I was 13 years old. I went through a Naruto phase but everyone thought I was FlyMan so I put it on the backburner. S. 7 or 8 years. GP. Of all the local cosplayers who are the ones that impress you the most? A. Yeah, he’s really good. Mines not really local but one I’ve seen online, Drefden. S. And all the Harleys are amazing! GP. How long have you been cosplaying for? D. I’ve been cospaying for about 3 years now, properly for about 2, I started out small and worked from there but about 3 years. GP. What’s your number one go to cosplay costume. 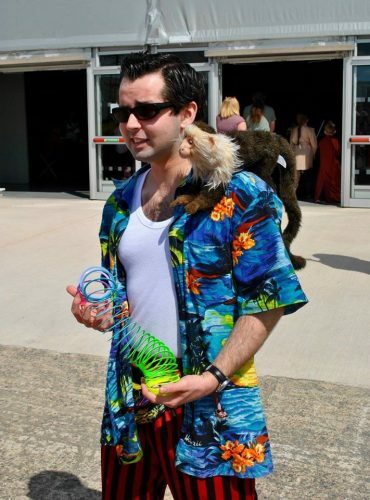 D. People know me mostly for Ace Ventura, I would say. I’m also known for Ash Williams (Evil Dead) but Ace would be my number one. GP. What’s your process when it comes to making costumes? D. (laughs) Well I’m not that talented, a lot of my “costumes” are cheap clothing from vintage shops and charity shops or just existing clothing I’ve had and altered. I’ll get the character and I’ll look up online and see what they’re wearing like Ash Williams is just shirt and trousers, Ace is just a vest and crazy trousers. The only thing I really made was the Ash Williams chainsaw. All of my props are made out of foam board and pins and glue and crossed fingers basically. GP. Of the local scene of cosplayers who impresses you the most? D. Ruairi (Red’s Domain) of course who does HellBoy, he’s always mentioned. He’s a prop-master; he’s done HellBoy Beast, Mr Freeze, Genie, he’s done more than I can remember. I quite like Megan (VeggieFiend Cosplay); she sews her own costumes and makes everything from scratch. I’m not just bigging them up because they’re my mates but they are two really talented individuals. I’m always referring people to check out their costumes. 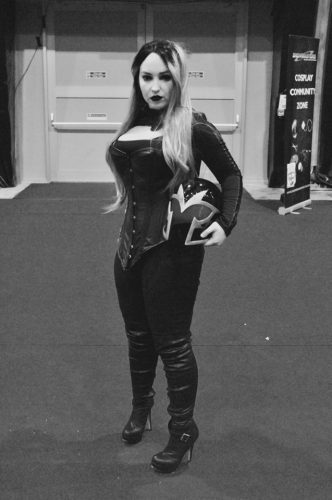 I like Charlie for blackink, she’s done Zoolander last night, she’s one of the best character cosplayers I know. GP. When did you start cosplaying? L. I started cosplaying about 8 years ago, my first costume was Roy Mustang from Full Metal Alchemist. I started cosplaying at Q-Con (Belfast) and it was just amazing. And I haven’t stopped since, it’s just got bigger and bigger. GP. What’s your number one go to costume that you have? L. My new one Dipper Pines, it’s not too warm and easy to wear, unlike this Kristoff one! Far too hot! GP. What type of cosplayer would you describe yourself as? Someone who makes, creates or finds things? L. I’m a bit of mixture. I would like to start building my own costumes, at the moment I’m building my own Samurai costume using PVC plastic. GP. Of all the cosplayers here today who impresses you the most? L. The Big Hero 6 cosplayers have impressed me the most! GP. So tell us how long have you been cosplaying for? A. About a year and a half maybe. GP. (Shocked) Is that it? GP. You look like you’ve been cosplaying for a lot longer! What’s the costume you’re known for the most? A. It has to be Poison Ivy. She was the first. Everyone knows me for that now. People come up to me and ask “are you not Ivy today?” So yeah people recognise me as that. GP. So what type of cosplayer would you describe yourself as? A. I would generally buy bits and pieces and assemble them together, I’m not the best at sewing but I am getting there. I’ve tried making things out of foam so I’m starting to branch out and getting better. GP. And in the local cosplay scene who impresses you? A. Oh there’s so many now. I really love Lady Bane, she’s awesome but there’s so many out there now! GP. So how long have you been cosplaying for? M. Well I’ve been a comic book fan for over 30 years and I’ve decided to start. I’m 45 actually! GP. Amazing, so what made you start cosplaying? M. Met a few friends who were into cosplay who mentioned to me that this was a thing and I started going to conventions. I was The Joker last year and now I’ve decided to do something a bit different. GP. So is that the one you’re known for the most? M. Yeah, The Joker, the classic comic book style. Too many movie Jokers out there. GP. So what’s your process when it comes to making costumes? M. I get bits and pieces online like the mask made from latex, the jacket I bought, I distressed it and dressed it down, altered it myself. Some stuff from charity shops and the likes, jeans and boots. The leg brace I made myself and the t shirt dyed with Punjanna Tea Bags! GP. Locally who in the cosplay scene impresses you the most? M. My friend Stephen and his kid is cosplaying at Hit Girl. It’s amazing that a whole family are doing it, it’s inspiring the next generation of cosplayers. I’ve heard a lot of negativity out there about cosplayers who look down their nose at costumes that are not screen accurate but at the end of the day if you spend £5 or £500 its about how much fun you get out of it! GP. How long have you been doing this? S. About 2 years when the first big comic con came about. 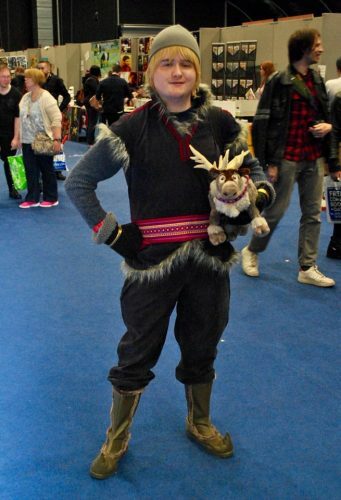 MCM was my first one and after that it’s just sort of snowballed. Actually the last convention I was going to pack it in and be done with it but then I was asked would I like to be a judge at this years BFCC. I was like sure ok! GP. So the costume you are known for wearing is of course Lady Bane. Why that particular costume? S. I don’t really know. I was my first one. I figure because I hit the bar so high I couldn’t really top it so I brought out Loki and no one cared so then I went on to Magneto and that was received very well but people still recognised me as Bane so it stuck. GP. What’s your cosplay process? Do you build things? S. Not really good at sewing and I’m hit and miss at building things but I made this Magneto helmet. But it’s not perfect as you can see (points to some obscure bubbling on the helmet). GP. I have to say it’s very impressive. Of all the local cosplayers out there who impresses you? S. I really dig Ruairi (Reds Domain) and Damien (Agent Delta), they just think outside of the box and they are really funny to watch whatever they do! They’re fantastic and they know how to work a crowd. GP. Tell us about your costumes and who you are here as? E. I’m here as The Joker and Alannah is here as Harley Quinn. GP. So how long have you guys been cosplaying for? E. Eriticon 2014 so just about a year and a half? GP. What do people know you best for cosplaying? A. I mostly do DC Characters. E. I’ve only started doing Joker in the past 6 months but Red Hood would be my main one. GP. What’s your cosplay process? Build? Buy? E. It’s a bit of everything really, the Joker costume was stuff I bought on eBay and then Alannah did my makeup. But a lot of my costumes , especially the Anime ones I make myself because I’m really handy with sewing. A. I’m just starting to make armour and sewing but this was put together with the help of me and my granny and the internet. It depends on how much time you have and how dedicated you are and how you feel about the moment. GP. So how has the Cosplay scene in Ireland evolved? Has it upped its game over the past few years? E. Well in good ways and bad. 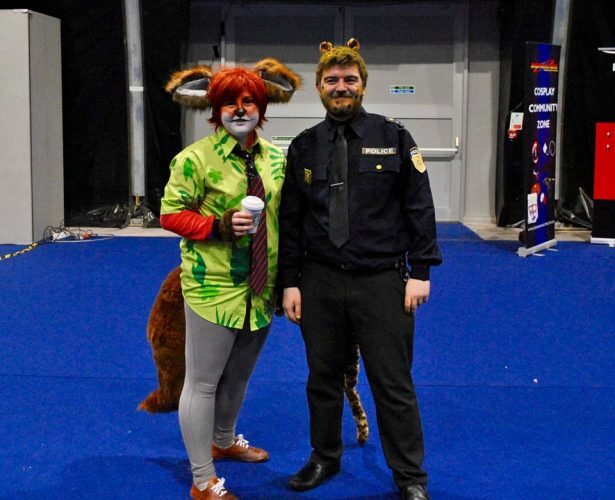 The cosplay community in Northern Ireland can be a mixed bag of personalities. I met some of my best friends through the Belfast cosplay community but some of the nastiest people I’ve met are there too but you don’t let people like that stop you. If I was going to let the haters get in my way I would have stopped going to cons ages ago. GP. Who do you admire on the local cosplay scene? E. Micheal McCabe who runes LocDown events. Everything he does is so fantastic, the amount of charity work he does sets him apart from all the rest. A. I’m from Dublin so I don’t know many of the local Belfast ones but I’ve met Micheal and hes really nice so I’d have to agree with Eli. GP. Tell us who you are cosplaying as? T. And I’m Natasha Romanoff from the Avengers. GP. And how long have you guys been cosplaying for? T. About 5 years now. GP. 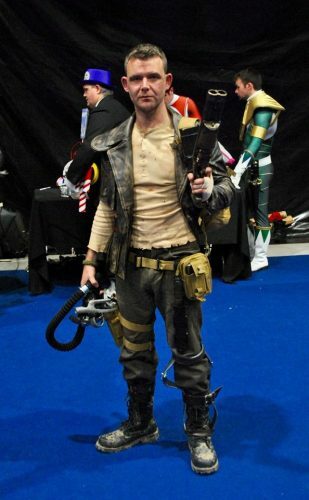 Was there much of a cosplay scene in Belfast 5-7 years ago? A. Not so much here but down south in Dublin with events like Ertikon and from there it went from other conventions like Q-Con and the big ones so it’s been around for a good while. GP. And what are you go to cotsumes for conventions? What are you known for the most? A. I don’t have one yet I don’t think. 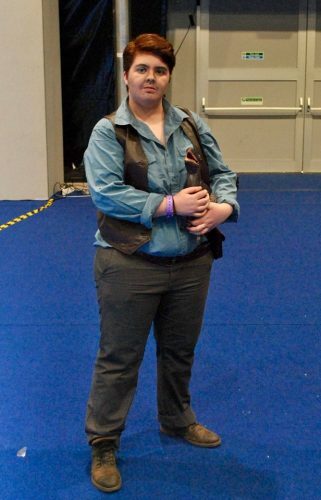 But I do love Chris Pratts characters and I’ve cosplayed Star Lord and Owen Grady but I think my favourite ones are the Star Trek ones because they are a lot more comfortable to be honest. GP. What’s your cosplay process? T. I love making my own costumes but I wouldn’t be elitist by looking down at someone for buying their own costume because all of this is bought. You’ve got to sometimes! A. I like to find bits and pieces, it’s not going to be exactly who you want it to be. When you get it you’re not going to get it completely right so you have to modify things to suit your tastes. There’s a lot of screengrabbing and a lot of work to look into it. Make up is tough as well. GP. Who in the local cosplay do you look up to? A. Shannen and Charlie, definitely. T. Yeah those two are amazing. I’m good with costumes but with make up I cant quite get it and they’re great. A. Shannen and Charlie are very supportive! The Showmasters Belfast Film and Comic Con took place at the Titanic Exhibition Centre Belfast on the weekend of the 14th and 15th of May 2016.